Containment Protocols: A 30km quarantine zone around the former site of reactor 4 must be maintained to prevent the spread of the anomaly. This is officially named as the "Chernobyl Nuclear Power Plant Zone of Alienation", or 'exclusion zone' and is staffed by a mixture of Authority assets and Ukrainian military personnel. All civilians entering the zone must be accompanied by Authority field agents and researchers disguised as tour guides and tourists respectively. This allows for an undercover study of the wider region, as well as steering the populace away from areas of higher radioactivity which may indicate the presence of RPC-086 instances. All persons and vehicles entering and exiting the zone must be checked for contamination. All persons living within the exclusion zone must be provided with regular contacts, and tests of soil and groundwater for traces of radiation indicating RPC-086 must be performed regularly. Unauthorized access to the exclusion zone is to be treated with immediate detainment and interrogation, evidence of RPC-086 is to be confiscated and such detainees are to be treated with amnestics before being passed to the Ukrainian authorities via prearranged channels. An image of a group of RPC-086 instances traveling towards ██████████, █████████. Description: RPC-086 are a group of humanoid anomalies which inhabit the Ukrainian town of Pripyat, the remains of the Chernobyl power plant, and parts of the surrounding area. 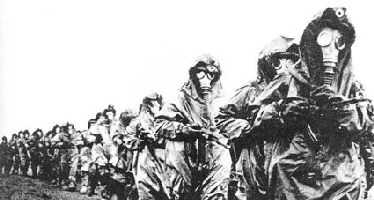 These figures outwardly resemble humans in 1980s era soviet hazardous materials suits including gas masks and emit high levels of radiation, the highest levels recorded by a researcher being 180 Sieverts per hour. A level which would deliver the lethal dose of 5 Sieverts within 100 seconds of continuous exposure. RPC-086 instances appear to be fully solid and will move their heads to look at moving objects, often giving preference to moving people. The instances often move in groups of 5-10. Said groups tend to move to distinctive locations with higher than normal levels of radiation and engage in motions that, to human observers at a distance, appear to be similar to radioactive decontamination procedures. Tests in regions afterward show slightly heightened radiation levels. Initial attempts to secure instances of RPC-086 for containment proved impossible: when instances were moved ██ kilometers from the center of the exclusion zone, said instances collapsed leaving only the hazmat equipment on the floor of their containment trucks. No trace of anything inside the hazmat suit was discovered by investigators. Furthermore, said suits maintained their extreme levels of radioactive contamination, and no change was reported in the total number of instances active within the exclusion zone. Instances of RPC-086 are non-hostile unless provoked, but the high levels of radiation emitted mean that establishing communication for interviews has proven difficult. During the first recorded interview from KGB era documentation, a political prisoner equipped with a series of questions, a notepad, and a piece of paper was used, this resulted in the death of the subject from acute radiation poisoning soon afterward, and the original documents still show high amounts of radioactive contamination. Later attempts have tried to make use of autonomous vehicles, dead drops, and abductions of single instances to reduce risks to staff. The current interview protocol involves isolating singular instances of RPC-086 and inviting them into secure, lead-lined rooms for an interview. This has yielded several interviews with some information, though most interviews yield no, or little useful information, with instances of RPC-086, simply sitting silently in the cells, or, if interviews are done in quick succession, performing the motions of radioactive decontamination in the cell. When angered, instances of RPC-086 display abilities near peak human fitness, capable of outrunning most individuals. Instances of RPC-086 seemingly attempt to use nonlethal methods to subdue the targets of their aggression, however, the levels of radiation exposure that result often inevitably lead to the death of subjects. On occasion, subjects injured before or during restraint have been carried into the main hospital complex in Pripyat (МСЧ-126). Further examinations of the hospital have yielded no traces of abducted subjects nor any trace of instances of RPC-086. The appearance of RPC-086 instances beneath the hazmat material is currently unknown. During Interview RPC-086-δ attempts were made to make facial scans of RPC-086 through the lenses of the mask it wore resulting in ██████████████. Currently, the only known image of an instance of RPC-086 beneath the hazmat suit is under review and study for further information about the nature of this anomaly, a written description is included with Interview [DATA EXPUNGED] No written or physical copies of the appearance of RPC-086 are to be kept in this document to prevent ████████████████████████████. As enclosed in this letter, I visited the site of the recent nuclear incident near Pripyat. My first on-site thoughts were of the use such an isolated and now potentially well-protected area may be for staging listening posts and the like, in keeping with protocol. In this, the town and reactor building itself does not provide much, both have many hotspots of radiation and will likely have them for a long time. I believe we should divert our efforts to the countryside, for this reason, the expansive terrain may provide better space for facilities that comrade Tikhonov may wish to keep secret. On a more curious and potentially serious note. Upon my last night in Pripyat I saw motion around the abandoned hospital complex, they appeared to be a large group of individuals wearing disheveled hazardous materials equipment. I presume these may be scavengers but felt that their behavior did not seem normal for such thieves of the people's remains. These may be rebels, survivors of the accident, or disguised western infiltrators attempting to scout the area as we are. ██-██-1987 These creatures, for they cannot be people, seemingly have no need to rest, though they are more active at night. We have observed a group of 12 performing seemingly standard decontamination protocols on a nearby building over the course of 3 days. Comrade ███████ checked the site with a counter after they had all left and noted a slight increase in background radiation over the whole building. ██-██-1987 Tried to be friendly to one of the creatures today to see if they could understand us. If so, these may be the greatest soldiers the Kremlin could ever ask for. Waved and yelled some short greetings to an isolated creature. It looked at me like it was curious but couldn't quite comprehend what it was seeing. Decided to leave well enough alone after that. ██-██-1988 Comrade ██████ is dead, there should be some record of him in the annals of our nation so this will be it. We noticed a group of 6 or 7 creatures approaching us steadily, our radiation alarms went off and the others including myself made a retreat, Comrade ██████ used his service pistol to cover us. Bljákha-múkha, the bullets just went straight through them and they sprang on him, the last I saw one had wrestled the gun out of his grip and had him pinned down. I cannot wait to get out of this accursed place. Interviewed: Lieutenant Colonel Chayka. Official Liaison to The Authority from the Ukrainian armed forces. Foreword: This interview was conducted on record to facilitate the initial hand over of KGB intelligence and for laying out what parameters Authority and Ukrainian forces in the exclusion zone will be operating under. LC Chayka: Ласкаво просимо2 Agent Williams. I trust you have read the documents we passed on to you? Agent Williams: Приємно познайомитися3. Yes, thank you, Lieutenant Colonel. May I call you Chayka? LC Chayka: Of course! As I see it, we are all friends here for the time being, and the manpower you offer to keep this… anomaly under wraps will be of great help. Agent Williams: It's our job to keep this kind of thing contained, but the documents were pretty sparse on details. Do you have any further information you can offer us to help? LC Chayka: The KGB was as tight-lipped as ever about the important details, even in their documents. But yes Williams, I can give you some more information about what we face here. Agent Williams: Thank you Chayka. LC Chayka: Think nothing of it, the more your men know the better they can avoid these creatures and keep them away from my men. Well, these things aren't alive. It's hard to tell because of the bulk of fabric and no one can get too close because of the radiation. As you may have noticed in the records they aren't that aggressive. They just, mostly walk around in there and seem to clean things. Sometimes they wander out further but the real problem is people wandering in. Agent Williams: So they're self-containing? LC Chayka: In a manner of speaking. From what we can tell from tracking them, most stay around Pripyat and the sarcophagus, but there's a lot that ranges about in the wilds, and they seem to us to be moving out further and further. This is simple speculation of course, however. It's difficult to track this many creature in such a large area. Agent Williams: I see. Thank you, Chayka. I'm looking forward to working with you on containing this. LC Chayka: As am I Williams. Closing Statement: Lieutenant Colonel Chayka was promoted for service several times in the following years, but still functions as an official envoy to The Authority on matters concerning the Chernobyl Exclusion Zone. Interviewer: Dr. Yiranek. Authority researcher for RPC-086. Foreword: The instance 086-δ was lured into a lead-lined mobile humanoid containment unit at ███████████████, Dr. Yiranek volunteered to perform the interview via two way thick glass. For his safety, Dr Yiranek was equipped with a lead-lined anti-radiation suit previously issued to MST-████████. The conversation was conducted in Ukranian and has been translated in full. Dr. Yiranek: Hello, are you comfortable there? Dr. Yiranek: Don't worry this is only temporary, we'll let you go to continue what you were doing soon. Do you have a name? 086-δ:, Of course, I have a name, it's ██████████. Who are you? Dr. Yiranek: My name is Dr. Yiranek. What were you doing out here? Dr. Yiranek: The fires? You were a firefighter? Dr. Yiranek: Of course, my apologies ██████████. Do you know how long you've been doing this job… Putting out fires? Dr. Yiranek: That's all we needed to know. We'll let you get back to your work. Closing Statement: 086-δ was released from containment and appeared visibly confused for a short time before continuing on the same heading it had been traveling in originally. Dr. Yiranek received 3 times the allowed workplace dose of radiation but has since suffered no ill effects from his exposure.